Two weeks ago, I was chatting with a reader who was researching low cost index funds. I was so excited because he wanted to learn about expense ratios, commissions, fees, and more. Although I talk about finance all the time, it's still rare to have someone interested for long periods of time. After chatting for a bit, I got around to asking him what made him so interested in the topic. He seemed like he was doing well enough. He definitely had some investable funds, was on his way to retirement, and everything seemed good. He told me - "I feel like my advisor isn't steering me in the right path based on what I read online on sites like yours." I asked him to elaborate a little bit for me. He said - "My advisor consistently talks about how he's the top performer in North Carolina. However, everywhere I read online says to invest with low cost Vanguard funds. When I mention that to him, he changes the subject or diverts to other topics. It makes me feel off..."
This reader had his account and financial advisor at one of the biggest two name financial firms in the country. For this privilege, the reader was paying a fee of $40 per year for the first account, $20 per year for the second account, and $48 per year for his retirement account. On the surface, paying a financial advisor just $108 per year is a good deal. My reader was annoyed by these fees, especially since his financial advisor would "blame them on the DOL Fiduciary Rule and Big Government", but when realizing they were pretty low, he felt better. But the fees don't really stop there. What's important to note here is that these are really expensive funds to own. Not only are there front-end sales loads on many of these funds, they have very high expense ratios, and many charge 12B-1 fees as well. Furthermore, it's weird the asset choices. We didn't go into too many details on account types, but he did share that his advisor was managing a regular account, a retirement account, and a 529 college savings plan. So, my guess is that in the retirement account, he want with some of the no-load funds because he couldn't justify the large sales load as a fiduciary. Ouch.... do you see how much this guy pays on his $199,000 portfolio - WAY TOO MUCH! And this financial advisor - he's making $7,427.50 in commissions on top of his $108 per year advisory fee. When you add in the expense ratio, this portfolio is costing the investor $11,004.71 in year 1. And potentially costing the investor $1,879.21 or more per year after! I should also mention that it's highly likely this individual is "rebalancing" his clients portfolios at least once a year - which means more commissions in his pocket. All at his client's expense. What I don't think he realized was that his $40,000 investment started at $37,700 because of this sales charge - so he was already investing at a disadvantage. Then, you add the huge annual fees on top of it! I personally think this is very wrong. And what compounds the problem is that this advisor wasn't transparent with his client. If an advisor is transparent and someone wants to pay - that's one thing. But when the client is left in the dark on the true costs of their investments - in my opinion that should be criminal. Looking at this guys portfolio, I don't even know if it really makes a lot of sense. But, for argument's sake, let's say it does. Could we build a much lower cost portfolio? 100% yes. Here's what a similar low cost portfolio looks like. Notice I combined a couple of funds into the same fund for large cap growth. The investments he was in didn't make sense - but it could be do to retirement account choices. Also, we chose a Vanguard 529 portfolio to mimic the existing 529 plan. Plan choices may vary, and it could make sense to open a state-specific plan. By simply investing in a low cost portfolio, we were able to reduce total costs from $11,004.71 to just $176.60. That's a 99% reduction in costs. Let's say that you even want to pay a fee-only financial advisor to help you set this up. Well, that would likely be a one-time cost of around $1,000. Even if you add that in, you're only paying $1,176.60 in year one, which is 90% less than you would with this financial advisor. Not only that, but the annual fees are significantly lower. The original portfolio was costing the investor $1,879.21 per year! This new portfolio with low cost mutual funds is only costing the investor $176.60 per year! A 91% reduction in annual expenses! In today's world, you can invest for free. There are multiple services, and many of the big companies, that have commission-free ETFs, no account minimum IRAs, and free stock trading. And the price of financial advice has significantly fallen as well. If you want a robo-advisor to invest automatically for you, Betterment charges just a 0.25% annual fee. The fact is, you should be focused on avoiding fees - fees are the biggest cost for investors over the long run. So minimizing them should be your top priority. But what do you need to watch out for? Sales Load/Loaded Funds - The biggest fee that hit our reader was the sales load. Almost all the funds that his financial advisor placed him in were "loaded" - meaning they charged him a fee to invest. In this case, it was almost always 5.75% up front. And the financial advisor received a commission from that load of 4.75%. Do you see why financial advisors can be incentivized to steer clients to loaded mutual funds? That was where the big money was for this advisor. The annual fee was nothing (just $108 per year). But this advisor was making almost $7,500 in commissions on this investor. Even worse, we were able to find less expensive funds for all the investments this financial advisor placed his client in. My opinion is that this is not in the client's fiduciary interest. I really wonder how the financial advisor would justify it in court if he was sued? The bottom line is, avoid mutual funds that have a sales load. You can do better. Expense Ratio - The next biggest fee to be extremely mindful of is the expense ratio. This is the percentage of your investment that you'll pay each year to the mutual fund/ETF company. It's an annual fee - so it compounds with your investment. Many basic ETFs and mutual funds have expense ratios of less than 0.25%. The best expense ratios are down 0.03% to 0.06%. If you notice in our reader's story, not only was he sold loaded mutual funds, but each of these funds had expense ratios over 1%. That's incredibly high (and in my opinion, should be outlawed). Typically, your expense ratio will be lower with stock index funds, and higher with bonds and international funds. The fees are just higher for these types of investments. The bottom line here - look for the lowest expense ratio possible. Commissions - Commissions are what you pay your broker to invest. For example, Fidelity has $4.95 commissions, but they also have many commission-free ETFs. You should look to avoid commissions where ever possible. But don't avoid commissions at the expense of higher expense ratios. For example, if you have a commission free fund at 0.10% expense ratio, and an ETF that you'll pay $4.95 for, but has just a 0.06% expense ratio - go with the lower expense ratio. Since it's a percentage of your investment, that's more money than any commission! In this example, if we invested $20,000 - the expense ratio at 0.10% is $20. At 0.06%, it's $12 per year - a savings of $8 per year - already overcoming the commission expense of just $4.95. 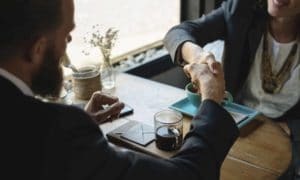 "Top Financial Advisor" - If you ever hear a financial advisor boasting about being the top financial advisor in their firm or area, seek clarification. You see, many firms internally rank their advisors by how much money they bring into the firm, or by how much commissions they're earning. As an investor, these could be the opposite metrics you want from your financial advisor. You don't want to work with the advisor earning the most commissions - because they are charging you those commissions! Now, some rankings can be helpful, but just do your due diligence before working with anyone. The sad part of this is that it takes a lot of time and effort to figure out what you're actually paying your financial advisor. I spent about an hour researching the fees, expense ratios, and commissions that the financial advisor was receiving for this article. And most people won't be spending their time doing that. I really with more advisors were up front, honest, and transparent about their fees. It's why I really like fee-only financial planners. You pay a flat fee up front and get a financial plan that you can execute. However, I don't even know if that goes far enough for what people need to know about their investment fees. I think that we've come a long way in disclosing fees for mortgages, car loans, credit cards, and more - but investments are still a very dark area. 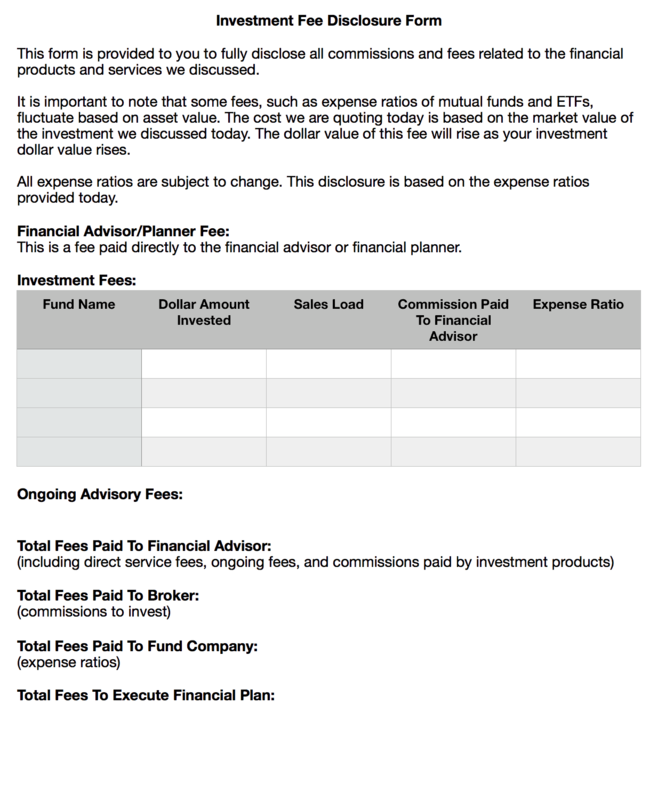 I wish that honest financial advisors would put together a one-pager fee disclosure, and would be required to go over it with clients. The client would then have to sign off on it. I think this type of form would bring a high amount of transparency to the costs associated with investing, financial advice, true fiduciary interest, and more. I really hate it when I see readers in a bad situation. I don't think it's right how this reader's financial advisor setup his investments. However, this is sadly a common practice and I've heard of it quite a bit. It's one of the reasons why I decided to not go into financial services after interning at a brokerage that was doing similar things. It just felt dirty. In today's world, you can setup a low cost portfolio and save thousands of dollars in fees. If you want or need advice, pay for it - but just make sure you fully understand what you're paying for and all associated costs. If you're not comfortable even managing your portfolio after getting a financial plan, then looking at a robo-advisor service like Betterment is a great way to go. For a small fee (0.25% of assets), they take care of everything start to finish. All you have to do is transfer money into the account - so simple. The bottom line is that you don't need to be gouged to get solid financial advice. And you should ALWAYS know what you're paying. ​What are your thoughts on this? Have you been taken advantage of (or seen it happen)? Do you think the fiduciary rule should be stricter in disclosing investment costs and fees? 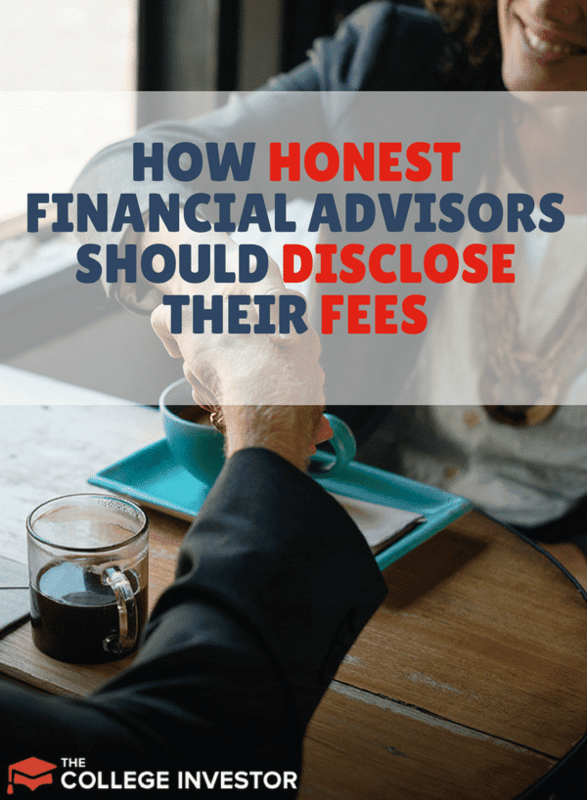 A relative has an advisor who says they are only charging her a set transaction fee – but I sense the commissions aren’t being mentioned here. A lot of folks are getting duped / charged without their knowing. If I heard my advisor boast about being the “top performer”, I think I’d run the other direction. It’s so hard to know what the fees are if you really don’t dive in and research it yourself. That’s why I wish we would see much more clear disclosures being required. Many investors will be enlightened. Many financial advisers will be frightened. I hope financial advisors aren’t frightened, but rather see the opportunity for transparency with their clients (and a even as a marketing opportunity). It is hard to communicate with a financial advisor because they get paid to not understand passive investing. Recently a financial advisor told me that the three-fund portfolio lacked diversity. I told him that it included every domestic and international equity. I don’t think he believed me. Wow… it would be time to find another financial advisor at that point. Maybe an exodus of funds under management would allow him to understand things better. This is the post of the day…if not the week or month. It makes me sick how some of these “advisors” who pretend to have their clients best interests in mind can basically rob people like this. Nice job pointing your reader in the right direction. I try to be unbiased and my thought is this – if this fee structure was accurately disclosed and the person still wanted to go ahead with it with full knowledge that it’s high cost, that’s one thing. But given there is no disclosure, I think it’s wrong. This is a great post! The math is simple but I hate how some advisors dodge the question. My wife’s employer had a Simple IRA in one of these plans and we were stuck using it, the $12k/year deferral plus match was just worth it even if the sales charges were brutal. (In service rollover after 2 yrs helped). There is hope, I’ve observed this income stream at a large financial institution (which I may or may not work for) rapidly changing from sales charges on loaded funds/annuities move towards percent of asset management fees, then those fees continuing to be compressed. The word is spreading! Glad to hear the word is spreading – but I’d still like to see transparency on what those fees are, even for AUM. I agree that all the fees should be explained, and be made super obvious. Unfortunately most clients just don’t care, and that makes ME sad. But I think we’re missing the question of value: What is that person getting for those fees? Up front loads are simply the difference between getting (and paying once for) professional advice or not. Some of those funds you can buy at Schwab with no load, and no advice. Which is fine if that’s what they want. Same goes for expenses: What’s the value? I’ll happily pay .64% and get, on average, 2%/yr better (after those horrible expenses) than the index. That makes a HUGE difference over the years. And if someone doesn’t want to pay for that value, that’s fine too. Side note: There isn’t any expense to rebalance if you stay within the fund family. When I worked in at a “shady” brokerage, they would never rebalance the same funds. The whole point of rebalancing on the broker side was to earn another round of commissions on the same client. Very dirty. I think it’s also important to look apples to apples. In your example, it sounds like you’re looking at an active managed fund that costs 0.64%. However, if you’re looking at index funds – they just mimic the index, which is the same as all funds that mimic the index. Why would you pay 10x more to own the same underlying stock? Very dirty indeed! If I’d try to rebalance into another fund family (read:churn), I would have got a call from our HQ pretty quickly asking for an explanation. That pisses me off just thinking about it! As for your second point, I’m not sure what you meant. If it’s comparing two S&P500 index funds, I agree the expense ratio is really all that matters. I’m saying several of the active funds you’d mentioned have actually beaten their indexes over meaningful periods of time despite their “high” fees. I consider a fee high when I don’t get value from it. If the managers have proven they can net me .5% (or 2%) more a year, I don’t really care how much they charge to do it. Take AGTHX for example: they’re one of the few funds that have handily outperformed the index for decades. I’m happy to “pay” them more when their performance easily surpasses what they charge. I find posts like these interesting. I’ve always thought FA horror stories were far and few between, and “of COURSE people rebalance into the same fund families!”, but clearly the horror is more common than I thought.